While world attention has been focused on the revolts in North Africa, and the beginnings of U.S. and NATO military escalation in Libya, recently in Pakistan a case of murder by a CIA “contractor” (read mercenary) has raised tensions in the region. It also shows the extent the U.S. is involved covertly in Pakistan in its war in the region. We have previously reported on the covert war going on in Pakistan orchestrated by the CIA and its private contractors, specifically Blackwater. 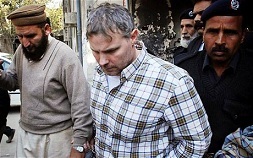 (3) This current incident left a lot of questions about the extent of Amerikan covert operations in Pakistan, not helped by the spin going on by the U.S. trying to secure his release. When he was first arrested the U.S. claimed Davis was a “diplomat,” only later coming out that he was a CIA contractor. The U.S. wanted him released on grounds of diplomatic immunity, which Pakistan denied. Davis was recently freed after a payment of $2.34 million in “blood money” to the families of the victims. 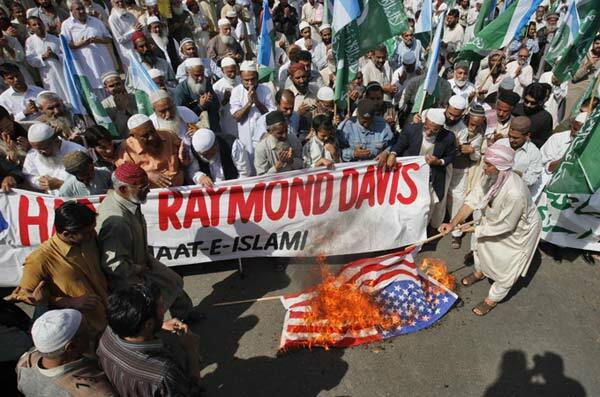 In exchange Davis received a pardon for his crimes, in a deal negotiated in a closed door court session in Pakistan. After the payoff, Secretary of State Clinton, becoming as expert at truth bending as her husband Bill, denied the U.S. made the payment. Some suspect it was the CIA, which operates under an unaccountable “black budget,” while others say it was the Pakistani government, with the expectation to be reimbursed by the U.S. government. The Davis case has increased tensions between the U.S. and Pakistan, whose relationship has been volatile since the beginning of the so-called War on Terror. Back in 2001 the U.S. twisted the arm of the Pakistan government to allow the U.S. to use the country as a staging ground in its war against the Taliban in Afghanistan. Pakistan, which previously supported the Taliban, did an expedient turnaround as the subsequent governments attempted to contain Islamists and anti-Amerikans inside their governments and within the populace. With this the CIA is not trusting of the Pakistani Inter-Services Intelligence (ISI) agency, for the latter putting its country’s strategic interests before the Amerikan’s own. It can be seen in this situation how the CIA is operating without any checks by Pakistan. One of the rumors circulating is that the two killed were connected to the ISI, and not just robbers as Davis claimed. As the Vietnam War was not only fought in Vietnam, the Afghanistan War is being fought outside of that country also, specifically in Pakistan. 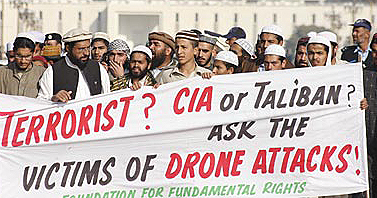 Among other things drone strikes have been a common occurence in the country, and have increased every year. Most of these strikes have targeted civilians. The opposition Pakistani parties are agitating on these issues now. Yet there is not enough blood money to be paid to compensate the people of Pakistan who have been at the receiving end of U.S. aggression. With covert CIA operatives and drone strikes out in the open, the face of the imperialist occupation of Pakistan has been revealed. It is no doubt the actual extent of CIA and military involvement in Pakistan is much deeper. The Pakistani people are right to resist Amerikan imperialism in their country. This should also be a warning to other countries aligning with the CIA and other agents of U.S. imperialism. Keep U.S. out of everywhere. Why do American taxpayers have to waste “$2,340,000” to bail out CIA and Black- water murderers, in countries where they don’t have a just right to be? SEND THE BILL TO BLOODY-OBAMA, the Commander of Grief. Shortly after that murder a drone strike killed 40 people, WITHOUT A TRIAL. HOW MANY INNOCENT WIVES AND CHILDREN WILL BE WITHOUT FATHERS? It is clear why the present adminstration is causing our once respected nation into international TERRORISTS, without just cause or reason. The money comes from exploitation of other nations, so every Amerikan has to pay. Amerika has caused many to be widowed and orphaned throughout its history, and even if Amerika was supposedly “respected” it had no reason to be. It has always been a terrorist state.